My wife Jennifer and I returned to Santiago from Portugal this afternoon, (tomorrow we return to Australia), and of course I wandered down to the Cathedral to take a last look. I spoke to several pilgrims who had just come in – some had struck bad weather (snow and lots of rain days), others had a clear run. It was wonderful to watch their faces as they walked into the square. It reminded me of the moment I did the same, over two weeks ago now. I also watched the camaraderie between pilgrims – obviously bonds that had formed over many miles and much hardship and joy. Wave upon wave of pilgrims arrive each day. From Iceland, Brazil, Australia, from all over the world. Many, when asked, say it was the film “The Way” that spurred them to do the walk. But I suspect there’s something much deeper running underneath it all. This is a movement. This is a social phenomenon. This is more than just a bunch of religious or spiritually minded retirees and young adventurers heading off to Spain to do a walk. There is something more profound happening here. People are asking questions that their current lives can’t answer. They walk the Camino to seek those answers. The Way listens to the questions they ask. And sometimes it might take a while, but The Way always seems to get back to them with some answers. Thanks Anne – sad to be leaving, but time to get on with my life again. I think I’ll post one more blog from Australia, and then that’ll be it for the blog – but I’m seriously thinking of turning it into an e-book. Will have to look into that when I get back to Aus. Thank you too for your comments and support during this whole amazing experience. Likewise Steve! Glad to hear today was a better day for you and Jill. Will post on your blogs separately. Then I’ll be out of action for about three days, because that’s how long it takes to get back home! Hope in the interim that you and Jill keep on putting one foot in front of the other, and Jill does some crazy dancing with that crook heel! haha – you’re right Ingrid. Bitter sweet. 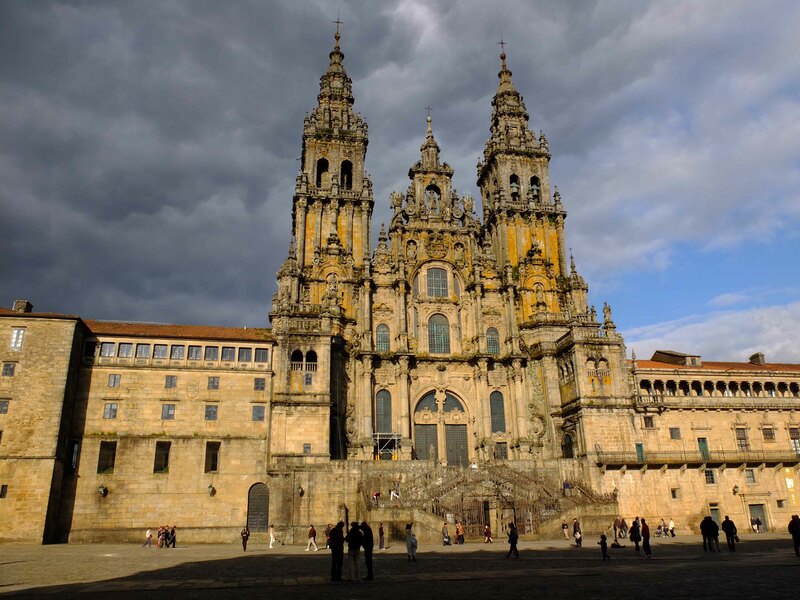 I came across your blog through the Camino forum at around day 10 into your walk. I had chosen not to read a lot of camino blogs because I wanted to have no expectations based on others’ experiences for when I walk the Camino myself (leaving St. Jean PdP on Sept 2), however I was charmed by your good writing, your beautiful photography and your thoughtful analysis of your experiences. I have really enjoyed “getting to know you” through your blog. I was simply an interested on-looker until the day you wrote Audit #6, especially and finally “…the only thing that really matters is love”. The lurch in my stomach told me that for you this pilgrimage has been a very real spiritual journey that has pointed you to that one and only Place, and that you have gone there. Thank you for sharing your innermost doubts, fears, highs and lows, triumphs and joys with all of us. I think your exploration of “intuition” through a documentary film could be one of the most personally challenging and fulfilling projects anyone could ever do. Dear Debra – it’s very difficult for me to respond to such a thoughtful and touching post as you’ve done here. I feel it HAS been a spiritual journey for me – although I didn’t set out for it to be so – it just… happened. It unfolded that way. And possibly in part, because of my physical challenges. It seriously unhinged me. Strangely, I also think that some of my long days helped take me into the place you call the Place. I think the metronomic and meditative nature of the walking, particularly along the Meseta, unclasped my logical and conscious mind and allowed my spiritual mind, (if that’s the best word for it) to slip into the place where rationality usually resides. I remember the day I walked 22 kms without stopping. I just got up out of bed, put on my clothes and boots and backpack, and walked 22 kms straight. Then I stopped and had a coffee, and walked another 12 kms or so. But that 22 kms straight was amazing, because I started to get quite light headed, and my thoughts began to free form and disassociate. It was as though I’d shifted into another state of consciousness. Anyway, I very much appreciate your writing to me like this – and once again, I thank you sincerely. I have so enjoyed reading your blog and collecting your photos. It has helped me to understand what my husband is experiencing. ( he’s now just past Leon ) I know he will come back a changed man, I just wish that I could physically have done it with him but it was not to be. Thank you and safe journey back to Oz! Dear Meryl – no doubt what he is experiencing is totally different to what I’ve gone through. For a start, your husband is probably a lot more sensible than me! But thank you for posting your comment as you have, If nothing else, he’ll probably be thinner! i have that same feeling as I get on finishing a really good book. Awaiting the sequel! Got to get my knee better first Vida. I think some serious yoga is awaiting me. If I was to do another Camino, I think it would be from Le Puy, in France – and I’d do about 1500 kms. But, the really hard one would be from my front door in Mudgee – walking the 300 kms into Sydney International Terminal would be the hardest stretch of all! Bill, with a tinge of selfish sadness but with joy for you and Jennifer to be on your way home, I share breakfast with you for the last time, on a beautiful chilly South Coast morning. I feel that you will be seeing the cathedral again. I hope to see it at least once. I would be very interested to know how the experience stays with you or has changed you once you return to the everyday, ordinary routine of life in Mudgee. Will life ever be “ordinary” again? You have taken me to a very different place within myself, through your blog. I have read many but they didn’t resonate in the same way. Lots of questions of myself, rethinking some of the choices I make, subtle changes. Thankyou. Thankyou. Travel safely home and welcome back to Oz. When I get my blog organized I’d like to send you a link, if you are interested. I can’t wait to see where intuitions leads you next…Buen Camino and Bendiciones! Thanks Silvia – I’m excited about the next stages too! I feel regenerated after this pilgrimage! Thank you Joe & Laurie. Am going to start thinking about an ebook when I get back. I’ve enjoyed following you on your spiritual journey, for spiritual it certainly was. I’m sure the insights you gained will stand you in good stead in your day to day life. I wonder if others will notice a change in you. The hardships and physical challenges you faced–humbling, in your own words–would certainly have made you more compassionate and gentle. Your words, and observations after the walk, have been inspiring. I’m fortunate to have come upon your blog. Take care of that knee and big toe. Safe trip back to Oz, and good luck. I hope that when your movie comes out I will hear about it in Canada. Wouldn’t want to miss it. Hi Rose, the challenge now will be to ensure that what I’ve learnt from this Camino stays with me back in my everyday life. Oh my gosh!!! Not only was this blog one of your best…but the comments from everyone else were so up-lifting. What an interesting little family we have become on your blog. Im going to miss everyone else as well. I find travelling back home (East) is really hard work. It takes me about 10 days to get my sleeping patterns back to normal. THAT was when I actually became a Pilgrim of the Way of Saint James. I don’t know what your name is, but this is a beautifully written piece – it put me there, with you, and I can understand why you became a pilgrim, from that extraordinary experience. Love your blog. Thanks for the inspiration. I am drying out in Estella today, start again tomorrow. Cold, rain, wind, mud, mud, mud. Glad i have my iPad so I can follow you. Have a safe journey. Hey Kathy, am now following you too! Just arrived back in Australia this morning. I can’t believe the run of bad weather you guys are having! I left St Jean Pied de Port April 10, arrived Santiago May 10, and apart from a few days of drizzle in Galicia, (to be expected! ), I only had 1 rain day. No mud at all. No snow. Crazy – it’s meant to be getting warmer and sunnier the closer you get to summer, isn’t it?? The only thing I can say is that it will probably be good weather over the Meseta. Looking forward now to following your journey. I’m missing the Camino already so I’m reliving it vicariously through you! I hope you are now safe in your homeland and continue the process you started in El Camino. Bill, there is much work ahead of you to be able to transfer all those feelings into a movie and to be able to touch people hearts and lives and I know you can do it. As I prepare for my retirement and for the camino, i will start also star a blog with my findings i hope u read it, i will concentrate in history. English is not my native language, so forgive me if i do not sound very good. I hope to meet you and your wife someday. If you ever in the US please let me know ahead of time. Please continue your Buen Camino. Thank you! Please send me the link to your blog. Yes, the film will be tricky, but no trickier than walking the Camino! We didn’t meet, but I was in Santiago at the same time as when you wrote this, Bill. I can’t thank you enough for your blog. Your post-Camino reflections mirror many of the insights I’m having now that I’m done, but haven’t found the words to express just yet. Thank you. I look forward to continuing to read! Sometimes it’s just stream of consciousness stuff, but hopefully in amongst it all there’s something that piques interest.